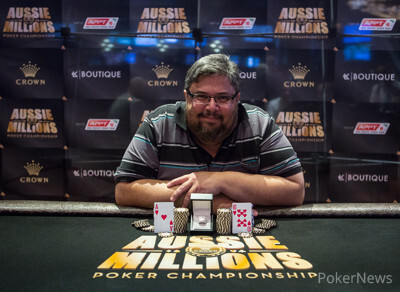 Aussie Gregory Cook took down Event #5 No Limit Holdem Mix Max inside the Crown Poker Room on Tuesday, defeating Ari Engel heads up to win a $51,230 first-place prize and an LK Boutique Aussie Millions Championship ring. The event drew 196 entries on Monday, playing full ring until they were down to 36. The final 36 played six-handed until after 2 a.m., returning with 25 players Tuesday. Once they reached the final eight they split off into seeded heads-up matches based on the chip counts. Martin Finger beat John Apostolidis and Craig Blight eliminated Felix Kramer to push through to the semifinals. Cook beat Cameron Couch, and despite starting as the eighth seed, Engel came back to upset chip leader Errolyn Strang to move on. Engel then made short work of Blight and Cook pushed past Finger setting up the final. Engel began the final heads-up match with the chip lead, but Cook took control winning the first couple of big pots in the first level to take close to a 2:1 advantage. Engel ran hot and pulled into a 2:1 lead of his own come the second level and increased that lead before doubling up cook with top pair versus bottom two heading into the third. Engel kept the pressure on and built the lead back up before Cook doubled again, getting it in with middle pair versus a flush draw and holding. 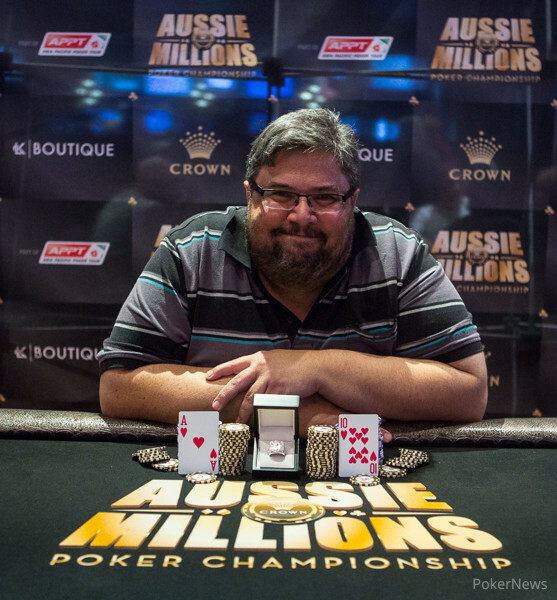 The lead went back and forth until Cook finally inched ahead and Engel called off with an outkicked ace allowing Cook to capture his first Aussie Millions title. An epic heads up battle has come to an end eventually and it is Aussie Greg Cook who emerged victorious. Cook raised to 40,000 and Engel three-bet to 115,000, which Cook called. The flop came and Engel led for 80,000, receiving a call. On the turn, Engel fired a second barrel worth 180,000 and Cook gave it some time before moving all in. "Some funky something? King seven? Diamonds? You have me covered?" "I think so," was the only answer Cook gave during the brief interrogation from Engel and the latter eventually called off with another 500,000 chips behind. The rail was gathering for the river card and rooting for Engel, but the on the river was a brick for the American and both players shook hands. For his second place, Engel takes home a payday of A$34,155 and another LK Boutique championship ring stays on home soil. Gregory Cook fired two barrels worth 60,000 each on the board and Ari Engel folded on the river. Then, Engel bet the turn for 30,000 and was called before both checked the river. Cooks's won the pot and he jumped into the lead again, albeit just by two big blinds. 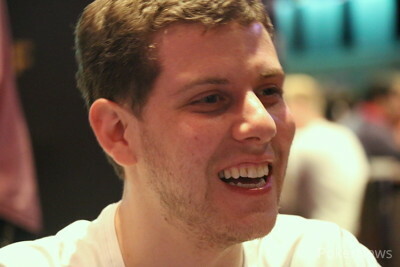 After losing a few smaller pots, Ari Engel recovered by three-betting to 91,000. Gregory Cook called and they headed to the flop. Engel continued for 45,000 and Cook called before the turn triggered a successful bet of 110,000 by the American. Then, the duo headed to the flop and Cook fired a bet of 30,000 with Engel calling. The on the turn saw a second barrel of 65,000 from Cook once his opponent had checked and the bet was called. Engel checked the river too and Cook now made it 150,000 to go. "Will you at least show me if you are bluffing? 150? I can't believe you. You have a jack there?" Engel spent a few minutes talking to himself and his opponent before eventually calling. Cook flashed the for a cheeky bluff and Engel raked in the pot with . Gregory Cook raised to 38,000 and was called to see a flop of . Ari Engel check-raised from 30,000 to 95,000 and was called before checking the on the turn. Cook now fired a hefty 200,000 and that enforced a quick fold from Engel. Ari Engel raised to 38,000 and Gregory Cook moved all in for 415,000 in total. The American gave it some thought but eventually said it was "still too much to call" and folded. Middle pair versus flush draw ended up in the double for Cook, as the board completed with the turn and river. The all in stack of the Aussie was for 431,000 on the flop. On the river, Ari Engel bet 63,000 and Gregory Cook folded. The Aussie gave up many other small pots as well and that took a toll on his stack, yet he still raises to 38,000 from the button. Engel defended and then bet the turn for 38,000 to enforce a fold. Gregory Cook won two hands in a row by first three-betting from 36,000 to 91,000 and then raising to 38,000. Ari Engel called and they checked down the board . Cook showed and that won the pot. However, the vast majority of small pots went to Engel without showdown. Cook raised to 38,000 and Engel called. On the flop both players checked. Engel then bet the turn for 36,000 and was called, also leading the river for 57,000. Cook called and then mucked when he was shown .